1. Freelancers need to manage their health proactively because if they are incapacitated by back pain it leads to downtime and a loss of income while they seek medical help. 2. Medical help or allied services costs money when you need treatment for a bad back because you have sat at your computer too long. Even if you have your own health insurance with ancillary cover the net cost can amount to USD40 per visit. 3. Back pain is very common for sedentary workers and can lead to the loss of the enjoyment of life by not being able to readily cope with family and other activities as well as working. 4. Back pain can lead to a loss of sleep due to discomfort and this leads to lethargy and the loss of productivity because of it. If you are having trouble with sleeping for this or any other reason you can get some help by clicking on the relative Amazon icon below. 5. When using a standup desk you have the opportunity to not only to move around and stretch but you can very readily do simple back pain relieving exercises while standing. We have included a book on this issue in the Amazon icon links below. 6. Standing desks have an added advantage in that they are very adjustable if you require to work at a drafting or designing documents position. 7. 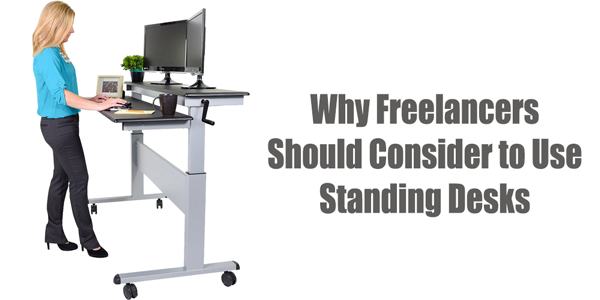 Many standing desks are readily adjustable and relocatable so that you are not confined to the one position if you need to move your workstation around. Here is a standing desk you may consider. This innovative adjustable height stand up desk promotes better posture, reduced back and neck pain, a thinner waist line and increased productivity. Click on the image to learn more about it. Freelance-work-guide.com is participating in the Amazon Services LLC Associates Program, an affiliate advertising program designed to provide a means for sites to earn advertising fees by advertising and linking to amazon.com.